It is a bird? Is it a plane? No – it’s a new lead for the hilarious comedy-horror-cult musical The Toxic Avenger! 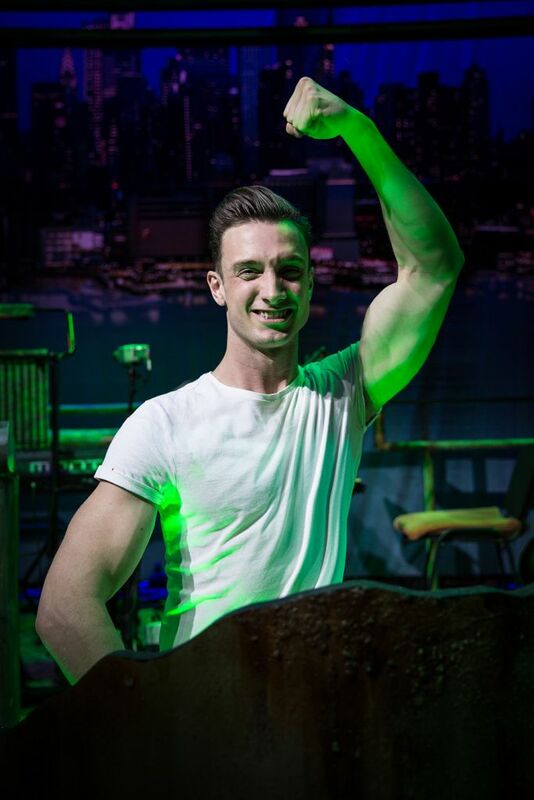 New leading man Ben Irish will join the cast of the hit Arts Theatre musical from tonight, replacing Mark Anderson in the eponymous superhero role for the final 4 weeks of the production’s current West End run. Ben will start performances tonight, playing the dual roles of nerdy Melvin Ferd the Third – an aspiring earth scientist, determined to clean up his home state’s major toxic waste problem – and his alter ego, The Toxic Avenger. Ben is a 2011 graduate of ArtsEd, where he gained a BA Hons in Musical Theatre. His recent roles include an Asia tour of Ghost The Musical, as first cover for the leading role of Sam Wheat, and two of Sasha Regan’s all-male versions of Gilbert & Sullivan operettas, Josephine in HMS Pinafore and Edith in the UK tour of The Pirates Of Penzance. The Toxic Avenger is the brainchild of the Tony Award-winning creative team behind the smash hit West End musical Memphis: Joe DiPietro and David Bryan, an original founding member and keyboardist/vocalist for rock giants, Bon Jovi. When the corrupt Mayor of Tromaville and her goons get wind of nerdy Melvin Ferd the Third’s green plans, they vow to stop him. Melvin is attacked and tossed into a vat of toxic waste… transforming him into The Toxic Avenger, a 7-foot mutant freak with superhuman strength and a supersized heart to match – New Jersey’s first superhero! The show is based on Lloyd Kaufman’s cult 1984 comedy schlock-horror Troma film of the same name, and features songs including Who Will Save New Jersey? and Hot Toxic Love. It’s currently booking at the Arts Theatre until 3 December. Book The Toxic Avenger tickets today!